This is a specialized, professional formula that balances odor removal without overwhelming your customers with an annoying strong scent. Zephair air freshener is a professional, commercial-grade spray used by the top Resorts & Hotels across the world. It's light and subtle fragrance doesn't annoy or bother those with sensitivities, but is engineered to attack the most horrid foul odors such as: smoke, mold & musk, food, urine and just stale air. Won't leave a sticky residue on fabrics and surfaces. Clean White Cotton fragrance is a terrific soothing and calming scent. Sold Individually for those that don't need a Case, or can't store a case. Protect your most valuable asset -- your hard-earned image & reputation for being clean and fresh. Commercial-Grade. 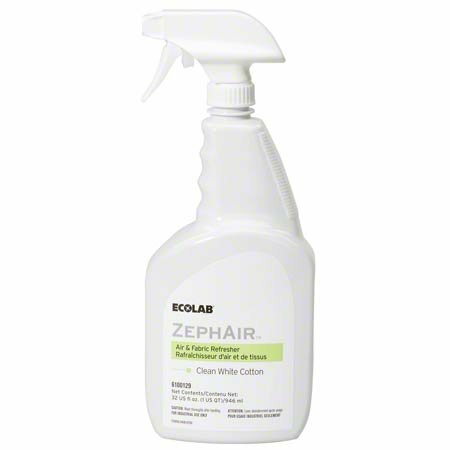 Ecolab Zephair Room Refreshner. Secret weapon to attack foul odors fast . . . without overwhelming strong fragrance.